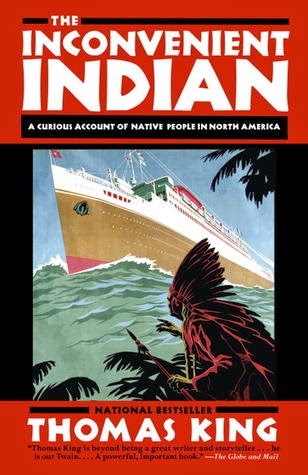 The Inconvenient Indian draws out many misconceptions about Natives and their history. The facts, ideas and history presented by Thomas King are informative and eyeopening. He takes a humorous approach to this book and I'm glad he does, otherwise it would be fairly depressing. King also mentions in the prologue that although this book contains historical facts, the narrative has been derived from his conversations with others along with his own beliefs. I also appreciated King's writing style. It feels like he is telling a story versus lecturing from a history book. It made it much more enticing and enjoyable. I strongly believe this is a book that every Canadian and American, for that matter, should read. Readers will be able to relate to King's writing style and will appreciate his straight to the point demeanour. I have officially read all five of the 2015 Canada Reads finalist books. I'm so happy that I challenged myself to get through them all before the debates. All five were wonderful books in their own way. Earlier I mentioned that I attended a Google Hangout featuring all five of the Canada Reads finalists, you can watch the entire segment here. All of the authors are quite hilarious. I will be writing a summary piece to highlight my pick(s) for the winning book next week. Keep an eye out for it!